2. Conductor composition: Selection of <99.9999% sterling silver line> Sterling silver conductor specifications: 0.30mm 1 placed in the conductor center 10 6 0.25mm silver plated ultra-pure copper wire, precision twisted into a round, three-conductor Were covered with Teflon <TEFLON> media. 3. Wire internal structure: three-core wire after the large pitch stranded in the center of the wire, fill the gap (white cotton line) with (SHIELDED) tightly wrapped, and then use (0.10mm high-quality silver plating) woven tightly shielded Layer, jacket outside the (containing special metal particles) of the black PVC. 4. Assembled original imported three-pin stylus plating 24k thick gold, the shell is all made of special expensive alloy material, excellent transmission of high quality superconducting XLR terminal, to ensure long-term use of quality will not decline, with higher Signal transmission level, can make your audio equipment, the potential to get the full play. 5. In the input end of the original import strong filter magnetic ring, can effectively eliminate all kinds of high-frequency electromagnetic interference, can make the music background pure and noisy, sound more sweet, transparent, natural, real, restore more audio details, Perfect match for advanced HI-FI sound system. 6. All welding points are used in Germany WBT original silver tin professional welding, quality assurance. High-quality audio equipment or studio equipment almost all use a three-core XLR balanced (interchangeable line resistor) connection terminals. This is because purely professional audio equipment almost all use a balanced circuit. When properly used, the circuits and equipment that balance the topology are generally not affected by ambient noise. The balanced connection consists of two separate wires of the inverted signal and a wire that provides ground. The noise will appear equally, but the phases are reversed, so that they can easily be offset from each other at the connector. Essentially, it is the same as the technology used to eliminate headphones. With the benefits of the balance line believe that the sound fans should know: First, the balance of the output voltage is non-balanced twice the volume as long as the open to half of the non-equilibrium, more power, the sound sounds more full; Common ground, the whole listening noise is much lower than the non-equilibrium, can hear more details. And this is why only high-level audio equipment will have a balance terminal reasons. 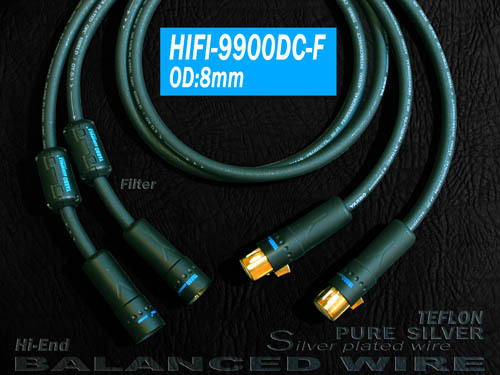 YARBO AUDIOPHILE CABLES The latest HIFI-9900DC-F balance line, wire core selection of high purity silver silver plated silver, plus high 24K gold-plated XLR connector, durable, practical use of solid contact, gives a very peace of mind. Advanced wire will not only be used in the selection of materials, taking into account the durability and stability of the wire so YARBO selected Teflon coating, if the government equipment on the balance terminal, I strongly recommend that you must use the balance terminal, and high quality Stable balance line, you can choose this pair of Germany YARBO "Accor" balance line. With the proposal: coaxial line into the balance of the most obvious effect, but the premise is that the equipment should have a balanced input and output. Sound system is boring, dark, the body does not condense the problem, you can consider using this YARBO "Accor" balance line. There are two types of audio signals, namely, balanced (XLR) and non-balanced (RCA). Balanced output (male), power amplifier pre-input (female) port is the use of three-pin connection plug, balance the transmission line of the three-core, a core transmission positive half-wave (positive phase) signal, a core Transmission is negative half-wave (reverse) signal, the last one is the ground. It is the use of the principle of phase offset, the audio signal transmission process to minimize the other interference, in the longer distance signal transmission has a more obvious advantage. The unbalanced output input port typically uses two pin connection plugs, which have only two terminals - the signal terminal and the ground terminal. Balanced signal transmission lines are not susceptible to external communication, other crosstalk, electrical equipment, noise and other interference. Balanced transmission is clearly better than unbalanced transmission, does not seem to have the consensus of the audio industry, because some big speakers regardless of any grade in their own products do not use balanced output, they may think that non-balanced transmission is more balanced than the balance Music taste, perhaps that the gap between the two, do not have to put a lot of cost in the balanced design. There is a sentence seems to be the footsteps of this idea, that is, balanced "in the longer distance signal transmission has a more obvious advantage", that is used to use the equipment used in the transmission line is very short, then the degree of the embodiment of this advantage May be negligible. The balance between the equipment must also pay attention to a problem, that is, the United States and European specifications are completely different: three core in addition to grounding, positive and negative two-core US regulation and the European regulations is the opposite (US regulation 1 to 2 3 negative, European regulations 1 2 negative 3 positive). If the sound source and power amplifier balanced interface specifications, can not be connected to use? Yes, but the sound is reversed (the speaker vibrates backwards, and the sound field becomes narrower and the sound is slightly boring). Can you make a normal sound? Can also, is to put the speaker line reverse, then the sound is completely normal. But there is a need to pay attention to the premise, your system can only have this one source can be so handled. If there is another (unbalanced) source, it can not be handled simply because the voice is normal after the speaker line is reversed, and that one is reversed again. So it should choose the source, amplifier balanced output, input interface specifications of the same model. There are a wide range of disagreements about the difference between the two output modes of unbalanced (RCA) output and balance (XLR) output, from sound manufacturers to people with audio enthusiasts. Support for non-balanced output of people think that this output mode is the most delicate and gentle, the most musical taste, XLR is not the top of the production of RCA opponents, like JADIS, AUDIO NOTE, MBL, GOLDMUND these Hi-End brand held Is this view, their products are not even support the balance, many models only RCA output, music and fax attitude is even more obvious, even his home flagship product, priced at around 800,000 KW before and after are There is no balanced input. For the other side, to support the balanced output of the people that this output is the most full of sound, dynamic larger, wider extension, more music taste, like Guifeng, FM, BOULDER, PASS, MARK, KRELL, CELLO, Golden voice and many other Hi-End brands are more holding this view, many of their products are recommended to use balanced output, or even only balanced output. But I am inside this argument is not very cold, I think professional equipment and non-professional equipment need not have to share the same standard. Professional equipment such as some monitoring equipment requirements in the long-distance transmission without external interference signal interference, require a higher signal to noise ratio, OK, balanced output mode will be more advantages, more appropriate. However, in non-professional areas, especially in the use of the family, the transmission distance is not a prominent problem, the balance of output advantage will be diluted, balanced and unbalanced output, the two are on the same basis, Take whatever is done Of course, although I hold this idea, but in the actual use of the process is still more emphasis on the use of RCA lotus head with the wire instead of XLR XLR, which is purely by the inertia of the. But this time I get the hand is an Arsenal Yarbo's "HIFI-9900DC-F" balance line, it seems no longer by inertia. It should be said that the Yarbo Yarbo "HIFI-9900DC-F" balance line in the appearance is not how eye-catching, its diameter is only eight millimeters, jacket covered with black PVC material, with the "new sound" Audition room that the thickness of those pipes, net shield body balance line and put together, almost disappeared. But touch up the words, "HIFI-9900DC-F" line body is not like other wire is generally hard, but flexible such as water snake, it feels quite good. According to statistics, "HIFI-9900DC-F" conductor material used in Germany 6N sterling silver and pure copper wire. Production is a 0.3 mm diameter silver thread placed in the center of the conductor, and then arranged around the diameter of 0.25 mm, the surface after two silver-plated ultra-pure oxygen-free copper wire, precision twisted into a round, and then Will be three core conductor were draped Teflon media. Three-core wire stranded after the completion of a large pitch built in the center of the wire, the gap filled with white cotton thread, and then selected 0.1 mm high-quality silver-plated wire braid shield tightly wrapped up, but also in the jacket outside the PVC material Added special metal particles to pure sound quality. Of course, the "HIFI-9900DC-F" line at both ends of the XLR terminals are not used, these terminals are all imported, and in its three-core stylus plating 24k thick gold, the shell all the use of special expensive alloy material , The signal transmission effect is excellent. Not only that, at the input, it is also equipped with a strong imported filter magnetic ring, to effectively eliminate all kinds of high-frequency electromagnetic interference, pure music background. "HIFI-9900DC-F" on all the welding points are also used in Germany WBT original silver solder welding to ensure quality. After getting the "HIFI-9900DC-F", I took it out of the velvet wooden box and put it on the equipment that was being opened, giving it warmth. Although this is a bit urgent, but before the trial line, this procedure can not be omitted, because the seedlings to promote the final to fold the thing Well After a few days, to see its performance is basically stable, I will "HIFI-9900DC-F" connected to the Cary CD 303/300 HDCD player and Tianyi Winner AD-2N stereo power amplifier between the merger, with the voice of the United States SPM-30 floor speakers for formal listening, compared with the reference wire is the force of the JPX-10000. I first appreciate the music is a new artist Li Qiuhua album "Arctic North". Although this is a new album, but inside the new song but not a few, "a thousand years later," "fly forward", "write a song", "Forever Love" "fairy tale", "Hey Judy" Win the old song is still inside the pillar. I understand the plight of the record company in recent years, and now because of the increasingly developed network of information dissemination, all songs can be downloaded free, too easy, fans are too lazy to listen carefully, but the appetite has become increasingly The more picky, the general level of works are often dismissive. The record company to launch a new person, not only involved in the high cost, the risk is greater, if the investment is not satisfactory results, then the record company will be worth the candle. This kind of old songs with the new song although the practice is not very healthy, but it can better spread the risk, and will not make the launch of the album into a market poison. I heard "a thousand years later" and found that it is completely different with the original boys version of the feeling, the song did not hoarse, ups and downs, on the contrary it is calm and calm tone, seems to be in reflection, or in remembrance. I think this song was originally written for the girls and it Here, "HIFI-9900DC-F" showed a solid and solid side, especially its frequency band, sensuality and with a bit charming. In contrast, the reference line will be Li Qiuhua's voice was simple and transparent, such as Song-like fresh and clean. This is the direction of two different styles, regardless of Xuan Xuan. I also put on the "brilliant central band - classic male chorus" album, listen to the TV series "Railway Guerrilla" theme song "guerrillas song". Here, "HIFI-9900DC-F" shows a fairly clean sound floor and a wide range of sound, in which the baritone song also appears more tangible and colored. And listen to "in the distant place", you find that not only the performance of the piano played by the strength of the full, and smooth and smooth. "HIFI-9900DC-F" treble is actually very bright, but compared to the reference wire and slightly soft, no blunt expression. I think the Accor's "HIFI-9900DC-F" balance line does have a good performance in upgrading the performance of the equipment, although it is not a neutral neutral wire, but believe it will change the number of enthusiasts favorite.